So he’s not Superman after all—but how has he managed to lose to the legion of doom? Reprinted from The Adventures of Unemployed Man by Erich Origen and Gan Golan. 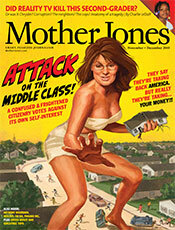 Read the “Attack on the Middle Class! !” package. ON HIS FIRST DAY back from summer vacation, President Obama appeared in a sweltering Rose Garden to talk about the economy. The latest numbers were disheartening—growth slow, consumer spending weak, housing sales down, unemployment near 10 percent. Obama reported that he’d just met with his economic team. He pointed out that his administration had already taken “a series of measures” to boost the economy, and that his aides were “hard at work” looking for more. He offered no specific proposals, and after five minutes he went back inside, taking no questions from the sweating reporters. One natural query would have been: Mr. President, how did you lose control of the economic message? Only months earlier, the administration had announced a push to remind the public of the positive impact of the stimulus. But the “Recovery Summer” campaign—press releases, big road signs, presidential and vice-presidential events—barely registered, and the “ground zero mosque” controversy dominated the summer’s silly season instead. And now, with the Democrats’ poll numbers falling in tandem with the economic indicators, the best Obama could offer were a few modest proposals. At a moment when his party was facing a possibly catastrophic drubbing, the president appeared on the defensive, his economic leadership anemic. How had Obama lost his groove? In politics, second-guessing is practically obligatory, and many of Obama’s calculations have already been subjected to the hindsight machine. The conventional take is that the president overreached, focusing on health care and climate while spending large amounts of money on the stimulus and unpopular bailouts—alienating those hard-to-please independent voters. There might be some truth in that diagnosis, but there’s more to it. It wasn’t just what Obama did, but how he did it. The president forfeited control of the narrative—as they like to say in Washington—because he blew several specific opportunities. SIZE MATTERS. The “original sin of the Obama administration,” says former labor secretary Robert Reich, “was to make the stimulus too small while giving out too much of it as tax breaks to businesses.” By most estimates, the stimulus saved or created about 3 million jobs, but it did not keep the unemployment rate below 8 percent, as the White House had projected (PDF). A stimulus twice the size would probably have generated about twice the benefits, notes Dean Baker of the liberal Center for Economic and Policy Research, meaning unemployment might actually have dropped to near 8 percent, and GDP growth would have been 3.4 percent or higher. Instead, the low visibility of the results provided Republicans an opening to dismiss the stimulus (which to some voters may have become conflated with the TARP bailout) as wasteful. They had an easy line of attack: You spent nearly $800 billion, and unemployment is higher than you said it would be. In the absence of a stronger case from the administration, the assault resonated with large swaths of the public. White House aides—and my colleague Kevin Drum—will say that Obama obtained the biggest stimulus he could, given GOP opposition. But the president need not have accommodated his foes so readily. “He could’ve demanded more, and settled for less,” says a senior Senate Democratic strategist. That would have at least established a useful story line: For more recovery, we need to do more. Instead, Obama was left hailing a stimulus that didn’t do enough. THE HEALTH CARE SLOG. The political problem health care reform created for Obama wasn’t so much caused by policy compromises over issues like the public option—though those may prove troublesome in the years ahead. It was, as one House Democratic leadership aide puts it, simply that “it took so goddamn long.” Obama did pass reform that had eluded Democratic presidents for decades—though it was a rather hard-to-understand package—and he could plausibly contend that fixing the dysfunctional health care system is critical for strengthening the economy. But some voters could conclude (fairly or otherwise) that Obama cared more about a pet policy than he did about jobs. BANKING ON THE BANKS. James Galbraith, a University of Texas economist and fellow contributor to this package, says Obama’s big misstep was letting Wall Street off too easy. By propping up rotten banks, the Obama administration diminished the chance that credit would quickly flow and grease the way to a significant recovery. Most Americans did not feel any direct gain from preventing the financial system’s collapse. And throughout the subsequent Wall Street reform endeavor—which fell far short of a true overhaul—Obama wavered between coaxing and criticizing the pirates of Big Finance. He routinely described the economic collapse as a “storm,” not a CEO-made disaster, and noted that there was plenty of blame to go around, from Main Street to Wall Street. That blurred the message, placing him on no clear side. At one point, his administration was denouncing executive bonuses, even as Treasury Secretary Timothy Geithner was OKing excessive bonuses for AIG. “It’s complicated” is not a good political slogan. By this past spring, with the recovery still weak, deficit fatigue had struck Capitol Hill, and even Democrats were skittish about any economic initiatives that cost anything. (Telling: At the end of May, more House Democrats voted to end the Pentagon’s Don’t Ask, Don’t Tell policy than voted to extend unemployment benefits.) In September, White House spokesman Robert Gibbs declared there would be no second stimulus; he wouldn’t even use the s-word to describe Obama’s latest economic measures. One of the president’s most powerful tools—proposing bold programs—had been lost. Granted, Obama had to push a case that would seem counterintuitive to many voters: At a time when everyone had to make do with less, the federal government would have to spend more. Yet he could have made that argument part of a bigger tale, one with heroes and villains, one in which voters could have a role and actively take a side. The Bush/Cheney collapse marked the failure of free-market conservatism, but Obama did not sufficiently emphasize this. He talked about fixes, not fundamentals. He did not effectively present voters with the key question: How would—how could—a post-industrial, post-dot-com, post-Big Finance economy work? Sure enough, Democrats became the targets of this economy-driven anxiety and anger—rather than figuring out how to explain and redirect it. (Noted: The specific subgenre of anger found among libertarian, anti-government tea partiers, ginned up by the right-wing media machine, may not be redirectable.) That’s not a surprise; the president and the party in power always become pinatas when the economy stalls. Much is indeed out of their hands. Still, Obama had not told a forceful enough tale about the economy. “There’s both an optics problem and a substance problem,” says a senior Treasury Department official. “The substance problem is that big options require Congress, and there’s little appetite for even anodyne things. And the White House, in the months before the final campaign stretch, hadn’t spent as much time as I’d recommend on public events showing that it’s his critical focus.” At his first presidential press conference, Obama told voters how they could judge his proposals: by looking at the employment rate. Many seem to have done just that. UNDERESTIMATING THE ENEMY. “You could see the right-wing campaign to discredit Obama and his policies coming from a mile away,” says Begala. Yet Obama did not prepare voters for this; he stuck with his Olympian desire to be post-partisan and nonjudgmental. That gave the Rs plenty of running room to misrepresent and obstruct. The last time a Democrat was in the White House, congressional Republicans—playing to their base and egged on by right-wing media—tried to destroy him. The week after that not-very-inspiring appearance in the Rose Garden, Obama kicked off the campaign season with a rousing speech outside Cleveland. He blasted the “blind faith in the market” that had caused economic disaster for the middle class. He praised his stimulus—without calling it that. He acknowledged that the bailouts had “fed the perception that Washington is still ignoring the middle class in favor of special interests.” Then he slammed Republicans for being the handmaidens of corporate interests and the rich. He clearly was trying to set up a political passion play. But could eight weeks of assertive campaigning compensate for 20 months of mixed (or failed) messages? It might have been too late to win back skeptical independents, but the president still urgently needed to rev up Democrats, who, according to polls, were far less eager to vote than Republicans. This underscores what may have been Obama’s ultimate political error: not keeping the base energized and engaged in the narrative. A president cannot control the economy. But he can control the story he tells. Did Obama Go Easy on Wall Street? So How’s the Economy Doing?